Case of a citizen of Georgia, Lea Shioshvili, 33 years old, could be one of the most dramatic amongst many of other cases which were brought by Georgia against Russia. The European Court of human rights will address those in legal hearings that started today in Strasbourg. On October 20th,2006 in the town of Ruza Moscow region Russian police (‘militsia’) detained eight months pregnant Lea Shioshvili, along with her four children, and then in a humiliating fashion deported her along with her family by train to Dagestan. Exhausted to the extreme Georgian family was able to walk across the border of Dagestan and Azerbaijan only in early December. Pregnancy of Lea Shioshvili was resolved with severe outcome in Gurjaani hospital on Dec 15th. "No one really cared, absolutely no one was interested in where we slept, or if we had any food to eat. What can I say, when they would not let me sit and didn’t give me a chair. All Georgians were thrown out from a train going from Moscow to Baku. For two weeks we were hiding in some Dagestani village at someone’s house. Then a man from our consulate from Moscow came to see us in that village, who made us a visa, and who took us across the border two weeks later. Very soon after my arrival to Georgia, my baby was born dead. 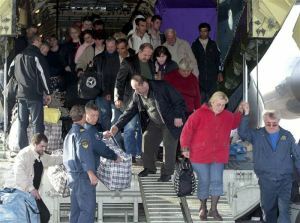 Kremlin's anti-Georgian campaign in 2006-2007 resulted in deportation of more than 7,000 ethnic Georgians. Of these, 2,380 were temporary accommodated in the special centers for foreigners, where they had to stay in inhumane and intolerable conditions. Due to these terrible conditions on October 17, 2006 in one of these centers in Moscow died Tengiz Togonidze, 58 years old ethnic Georgian. On December 2nd died 51 year-old Manana Jabeliya. In those days, was also killed Revaz Berulava, which was denied medical care in one of Moscow hospitals on the ground that he was ethnic Georgian. One of the lawsuits, which will be considered the European Court of Justice was introduced by Manana Jabeliya’s sons - Niko and Shahi Kvaratskhelia. Today in Strasbourg seven European judges listened to six Georgian witnesses, who were direct witnesses of the inhumane deportation in 2006.